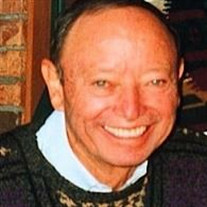 Bob Sanchez was born on December 23, 1929 to Manuel and Felicitas Sanchez and was raised in Albuquerque, New Mexico. He passed away too soon on September 22, 2017. Bob graduated from Albuquerque High School, University of New Mexico for his undergraduate degree, and dental school at Northwestern University in Chicago, Illinois. Bob served in three branches of the military. He first served in the Naval Reserves while attending UNM, he went for officer’s training in the PLC Program (Platoon Leader Class) of the Marine Core while attending Northwestern. After dental school he became part of the Army Dental Core. Bob met Eleanor “Ellie” Fleming in Chicago while he was attending Northwestern and she was working in Chicago. After his graduation, they married and immediately left for his tour of duty in Germany. They returned to Albuquerque, New Mexico in 1960 and opened his dental practice. Bob and Ellie had five children: Dr. Robert Sanchez and wife, Lianne; Linda Sanchez; Dr. Gary Sanchez and wife, Julie; Dr. Greg Sanchez and wife, Kate; Dr. Leslie Sanchez-Goettler and husband Drew. Their grandchildren are Jasmine, Reed, Bella, Jacqueline, Ben, Will, Jordan and Sophia. Bob provided a wonderful life for his family. He was a supportive father who always encouraged his children to “get ahead and stay ahead” and “get a good education.” His children were his number one priority and he loved spending time with them. He took them and their friends on many adventures to Elephant Butte Lake, snow skiing, and other fun trips throughout the years. Besides his family, Bob’s lifelong passion was sports: handball, The UNM Lobos and the Dallas Cowboys. He built Tom Young’s Athletic Club in the 70’s to share his passion with Albuquerque. After returning, Bob and Ellie got to do some well-earned traveling. They had friends all over the world. Later in Life, Bob took great care of Ellie as her health declined. He took her to the VA hospital three times a week so she could play the piano and he would entertain the veterans. He loved to meet new people and share his life with others. Bob always had a joke or story to tell. He was a kind and generous man. A Celebration of Life Service will be held on December 16th at La Vida Llena in Carter Hall at 4:00 pm. It is located at 10501 Lagrima de Oro NE Albuquerque, New Mexico 87111. In lieu of flowers please donate to the American Cancer Society or Alzheimer’s Association .